I finally got a standing desk. Here’s what happened. 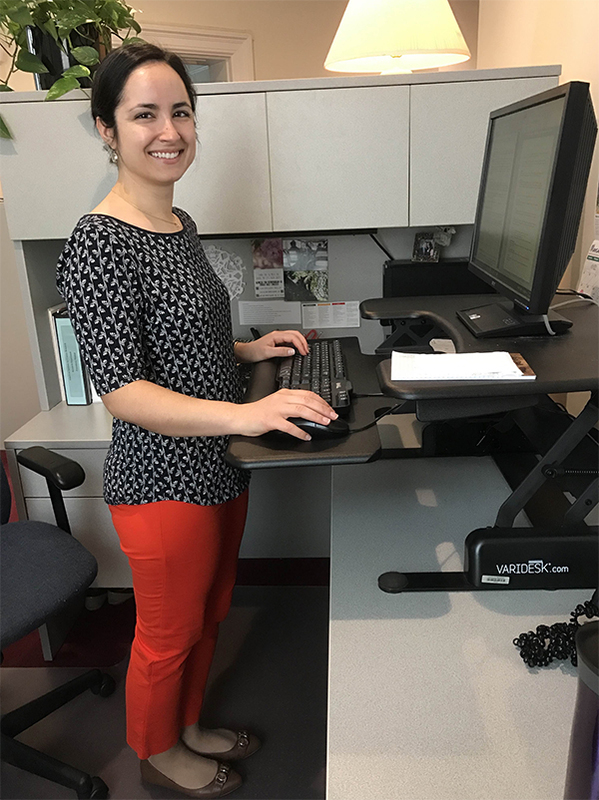 Two years ago, I interviewed a few of my colleagues here at AICR about their experience with using a standing desk. We were using the “sit-stand” variety that allows you to adjust the height but I didn’t get one then because of my desk setup. Last summer, though, I came back to the office from a week of being out and I noticed that my hips were achy after sitting for a few hours. I tried a few DIY remedies — using a footstool, walking about frequently,– nothing helped. Comfort: Right off the bat, I noticed that varying my time between sitting and standing alleviated the aches that come from the pressure of staying in one position for a long time. Improved focus: I found that when I stand, I am able to leave all the distractions of my desk and focus on one project at a time. I have also started only checking e-mail when I am sitting to help balance my time. Collaboration: It is much easier for two people to look at a computer monitor when it is raised up and both parties can stand close to see the screen. Gone are the days of co-workers crouching down awkwardly to examine a spreadsheet or attempting to pull up a chair to my desk which is really only meant for one office chair. Research is investigating how standing and moving in small ways plays a role in health and lower cancer risk. 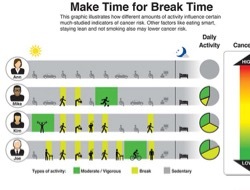 Currently, AICR research shows 30 minutes of moderate activity daily lowers risk of several cancers. Desk space: The standing desk I have does take up a substantial amount of real estate on my desk. To make things work, I had to move my monitor so that it was no longer located below my hutch, and slide my desk away from the wall to make room for it. Standing desk space: When I raise the desk to stand, it doesn’t hold lots of materials. That being said, however, it is large enough to hold a few documents, my phone, and a cup of water. Conclusion: If you have the space, and the resources, I highly recommend a sit-stand desk. My use of the standing desk comes in waves. There are days when I stand more often than I sit and I use the down time as a break. Other times, I sit the majority of the time and when I see a dip in my productivity, I stand up to re-energize myself. When I first started, I used an application on my desktop to remind me of when to sit and stand, but I no longer use it as I find that listening to my body, or just going with the flow of my work needs, is enough to keep me using the desk to regularly stand. I know there are lots of standing desk to choose from, including options where the entire workspace comes up with you. If you’ve used any of them – or any alternative desks — please share. Sit-stand desk is something that everyone should have. It has many benefits like you can get rid of muscular pain from your body. It can help you increase productivity of work at your workplace. I recently got a standing desk (by Uplift) at work. It has memory presets so I can sit or stand throughout the day. I usually aim to stand for about 2 hrs at a time. I’ve only had it for a few weeks, so still adjusting. Rose, do you use any kind of anti-fatigue mat, and if so, which one? I’m thinking of getting one to make standing a little more comfortable. Congratulations, Dave, and welcome to the club! I do not use an anti-fatigue mat, but you are the second person to ask me that this month. It never crossed my mind to get one, but now that it’s been mentioned, it seems like a very attractive option. I am lucky enough to work in an office with a casual dress policy, so I can get away with wearing very comfortable shoes that help me avoid achy feet. However, I can certainly see the benefits of investing in a mat, especially if your shoes aren’t well-cushioned! I have been looking into this. What brand/type of standing desk did you go with? I like that it’s easy to go up and down when I decide to switch to sitting or standing. There is a large variety of desks out there for people with different requirements (smaller for laptops, or larger for multiple monitors) so I suggest shopping around for what looks right for you.